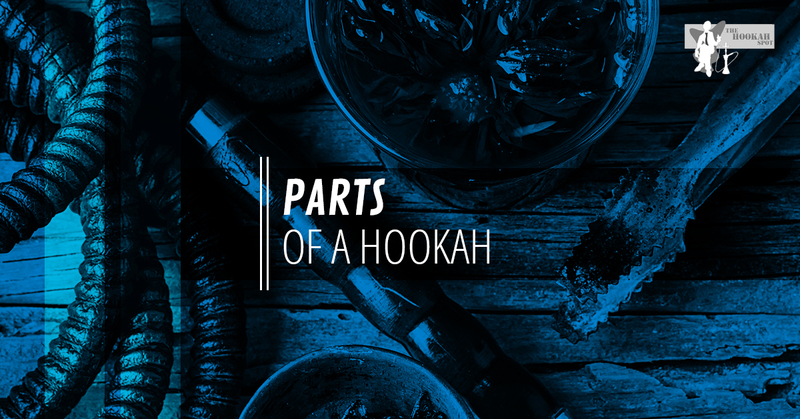 Regardless of whether you’ve never been to a hookah bar or if you’re a hookah connoisseur, you’ve probably wondered what parts make up a hookah. What causes such thick, delicious smoke? Why do we put water in the base? Does the type of coal we choose make a difference? We at The Hookah Spot are here to answer your questions. In today’s post, we are going to share a break down of the various parts that make up a hookah. Base: The base of the hookah is essentially what it stands on, but it also holds the water in place. Your hookah’s base is probably made of glass. They can be colored, etched, designed, and shaped to your personal preference! Pipe: The pipe is considered the body of the hookah. Typically, this part is made of brass, stainless steel, or tin. Pipes have two appendages that allow it to work with the rest of the hookah: the hose socket and the release valve. Hose socket: This is where you attach the hose. Release valve: This is a one-way valve, and you can unscrew it to see the small bearing inside. If your smoke gets too strong, you can lightly blow through the hose and force the smoke out of the base through this valve. Hose: The hose is made from ribbed rubber with wooden ends. One end has a handle and a metal mouthpiece to smoke out of while the other fits into the pipe hose socket. Bowl: The bowl is typically made of clay and will have either five small holes or one big hole. This holds the shisha tobacco and the coals. Coal tray: This is the resting place for the coal tongs, as well as a spot to catch any ash that may blow off from the coals. Tongs: These are used to handle hot coals safely. Plastic or rubber collars: These parts are optional, but they can help seal the hookah’s connection points better, meaning that the quality of smoke will remain consistent. Wind cover: This is also optional, but it can help protect the bowl and the contents. It’s usually a light, metal cylinder that sits on the coal tray. Disposable mouthpieces: These are optional, but many hookah bars use these mouthpieces for a more sanitary smoking experience. Shisha tobacco: The shisha is the tobacco that is placed into the bowl for smoking. It’s often made from molasses and fruit extracts that have been mixed with tobacco for flavoring. Coals: The coals sit on top and should be smokeless. These types are made specifically for smoking shisha. Do not use regular charcoal, as this can cause carbon monoxide poisoning! Here at The Hookah Spot, we want to ensure that you have the finest hookah bar experience around. Come and see us tonight to try one of our stunning hookahs and smoke some of our famous in-house shisha blends. We’ll see you and your friends soon!